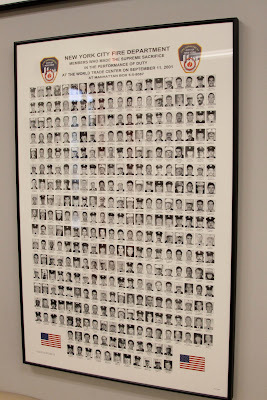 One of the first things you'll see as you come into the front doors by the receptionist desk at TheFireStore is this large collage wall in memory of 9/11. It was very important to our CEO, Mr. Witmer to make sure that there was a prime location to show our pride for this country and keep the memory of September 11th, 2001 at the forefront of our minds. This poster that's filled with many brave faces may be familiar to you. 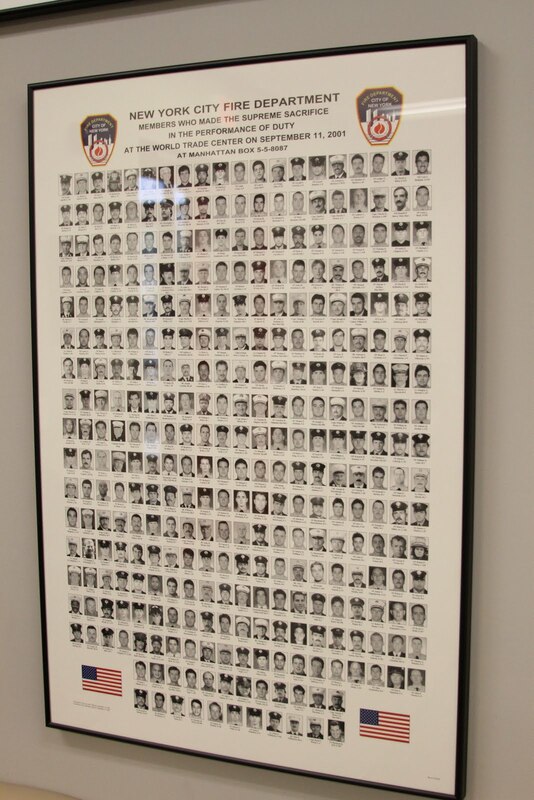 It's the faces of 343 fallen firefighters who lost their lives in the attacks at the World Trade Center. It's the faces of men, women, brothers, sisters, moms, dads, sons and daughters. It's a powerful image, and one that helps you to never forget just how brave and courageous these men and women were. This group of men, known as the "Band of Dads" was comprised of mostly retired FDNY firemen who persistently dug at Ground Zero to look for their missing firefighter sons. This group of men refused to walk away from from the WTC site until each last piece of debris was cleared. Some of the men were able to find their sons, while others were not so lucky and left brokenhearted. This photo commemorates these men, their determination, and mostly, the bravery that their sons embodied. This large framed commemorative patch is another item that you can find on the wall. It's comprised of the City of New York Police Department patch, the FDNY patch, and the Port Authority Police patch. This gorgeous, large embroidery commemorates the events at the WTC and all the heroes within those organizations who risked their lives to respond to the call of duty. So, next time you come by TheFireStore, be sure to take a look. Stop, reflect, and mostly, remember. Thank you for all that you do.